NBC: ELLEN’S GAME OF GAMES was steady at 1.2. THIS IS US slipped 0.1 to 1.7, and THE VILLAGE premiered at 0.9, down 0.1 from last week’s NEW AMSTERDAM, and a shaky start for a show that’s meant to take over the THIS IS US slot in a few weeks. 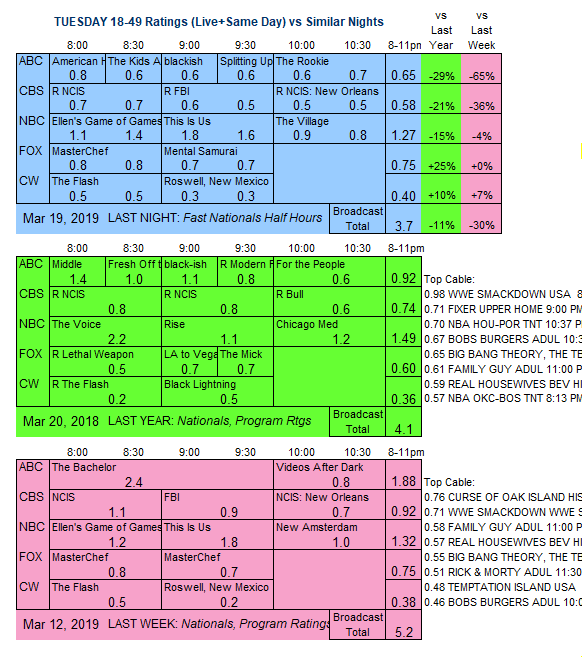 FOX: MASTERCHEF JR was at 0.8, compared to last week’s 0.8/0.7. MENTAL SAMURAI launched at 0.7. ABC: Despite a hyped AMERICAN IDOL-themed storyline, AMERICAN HOUSEWIFE dropped 0.2 from its last airing 3 weeks ago to 0.8. 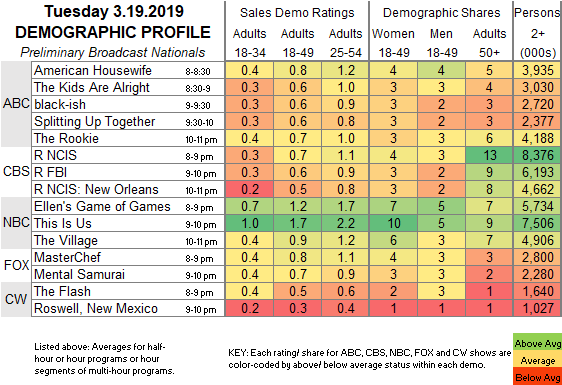 THE KIDS ARE ALRIGHT (0.6) and BLACK-ISH (0.6) both fell 0.2. SPLITTING UP TOGETHER was steady at 0.6, and THE ROOKIE was down 0.1 (from 2 weeks ago) to 0.7. CW: THE FLASH held at 0.5, and ROSWELL, NEW MEXICO gained 0.1 to 0.3. Tonight, CW airs the season finale of ALL AMERICAN, and Freeform premieres its PRETTY LITTLE LIARS spin-off, THE PERFECTIONISTS.